A TGV train from CDG to Disneyland® Paris offers a direct, high-speed train (200mph) connection between CDG Airport Terminal 2 and the Disneyland Paris park gates in less than 12 minutes with ticket prices as little as . Already in Paris and need to get to Disneyand Paris? See the Paris Disneyland train (RER) article. The TGV train schedule from Charles de Gaulle Airport (CDG) to Disneyland Paris has the first train departing at 06:54 in the morning with the last train in the evening departing CDG at 21:55. 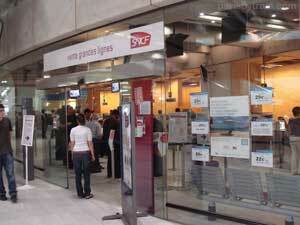 The frequency of trains varies from 30 minutes to 1h20 between each departure from CDG. Charles de Gaulle Airport has two separate train stations, one located near Terminal 3 and another located within Terminal 2. The Terminal 2 train station, known as “Aeroport Charles de Gaulle 2 – TGV“, is split into two distinct sides, one for RER suburban trains (going to Paris city center), the other TGV high speed intercity trains, one of which travels to Disneyland Paris. If you’re arriving at CDG Terminal 1 or Terminal 3, you’ll need to first catch a CDGVAL shuttle train over to Terminal 2. The photo tour of Terminal 1 to Paris contains instructions on finding and taking the CDGVAL shuttle, but don’t get off the shuttle at Terminal 3/Roissypole, stay on the shuttle until it arrives at Terminal 2. 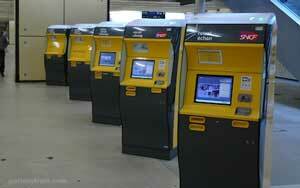 This may seem odd, but Terminal 2 is located after Terminal 3 on the CDGVAL shuttle line. At Terminal 2 the train station is located in between sub-terminals 2D and 2F. If you’ve taken the CDGVAL shuttle, you’ll arrive very close to the train station. 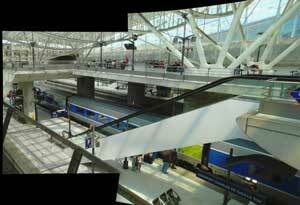 See the Terminal 2 to Paris photo tour for instructions on getting to the Aeroport CDG 2 – TGV train station. TGV tickets for the CDG to Disneyland Paris train can be purchased in advance online at Voyages SNCF UK for residents of the UK, from RailEurope.com for residents of USA (beware of delivery fees) and from TGV-Europe.com from elsewhere. See the article on how to purchase TGV tickets without fees from TGV-Europe. When buying tickets from Voyages Sncf UK, use “Paris CDG Airport” as your departure and “Marne La Vallee Ches” as your arrival location. When using TGV-Europe.com to find tickets, be sure to use “AIRPORT CDG 2 TGV” as your departure location and “Marne La Vallee” as your arrival station. After your TGV train departs, the first stop will be Marne La Vallée–Chessy station which is the train station serving Disneyland Paris. The travel time should be roughly 10 minutes from CDG to Disneyland Paris. Below is a photo of the Marne La Vallée–Chessy train station (on the left) within the Disney grounds.